I’ve spent so long looking at Jupiter in my backyard that I finally decided I wanted to see if I could spot anything outside of our solar system. Light pollution sorely inhibited my efforts, but I managed to capture a few things! I’ll keep this post short and just share two representative photos I took. Each photo has a small bit of blur in the direction of about eleven o’clock. This might have been due to a slight jostle that happened as I lifted my finger from the camera shutter. However, I’ve realized this blur could also have been due to collimation error. 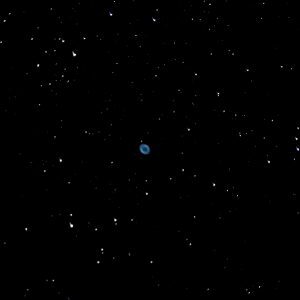 One of the best things I saw last night was the Ring Nebula. It was one of only two nebulae that I was able to get any sort of decent view of, given the light pollution. It’s a planetary nebula, and it subtends a disc roughly the same size as a planet like Jupiter. 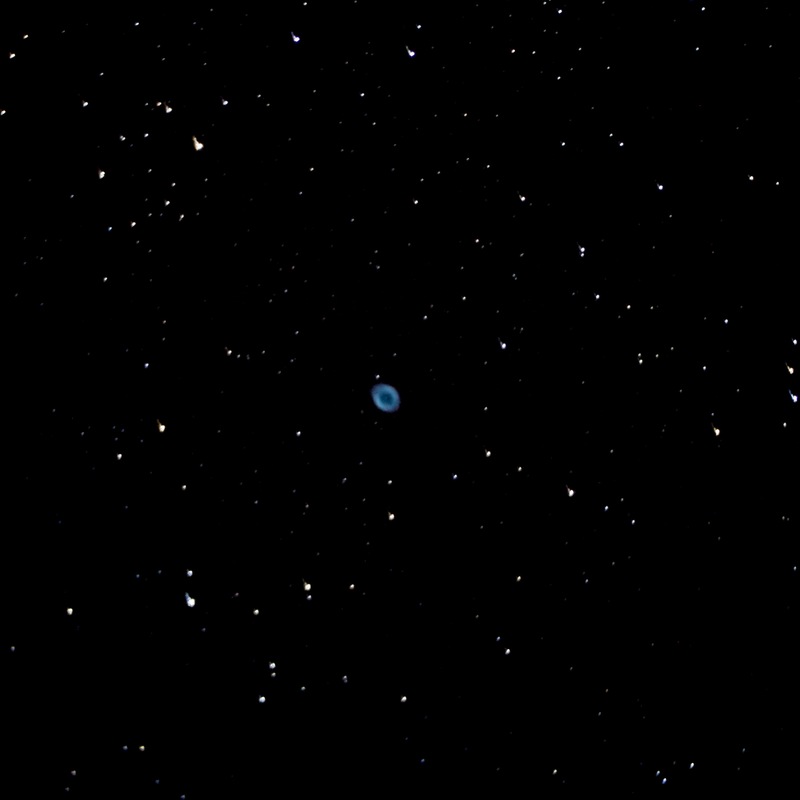 It, like all the rest of the photos in this post, were taken by my usual setup, with my telescope stopped down to f/6 by a reducer (which makes everything seem smaller and brighter). No physical filters were applied (meaning, nothing to block out light pollution). It’s been edited lightly to remove the light pollution haze and bring out the color and contrast. Seen with my actual eye, it looked largely like this photo, but the color was more difficult to make out. It looked ghostly and pale, like a puff of vapor. Color was a little easier to see if I looked just off to the side of it. 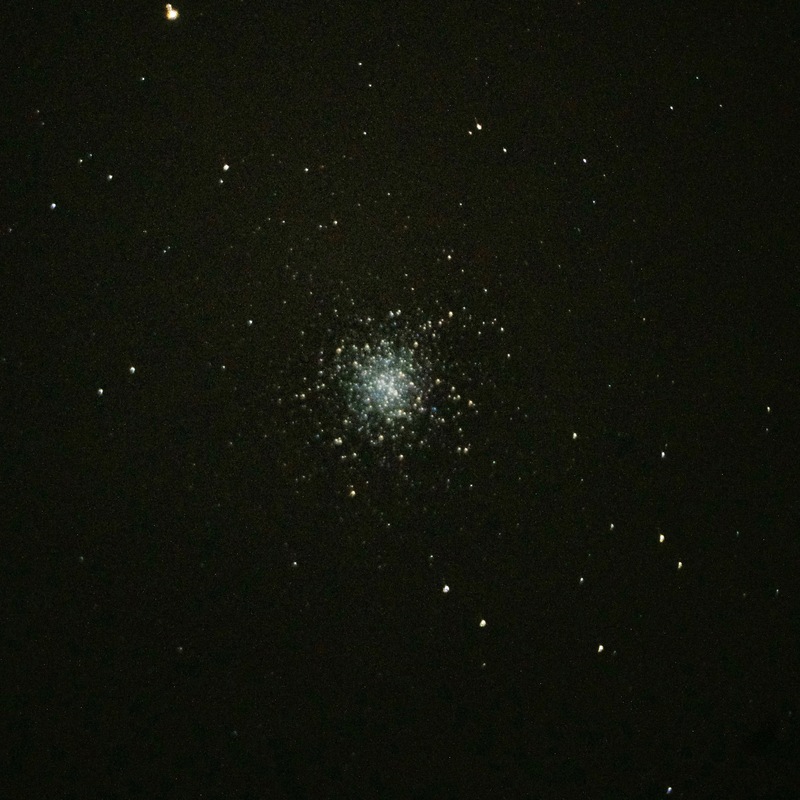 I didn’t expect a globular cluster to be any interesting to look at. Most of the targets of opportunity from my backyard were globular clusters, though, and I looked at a few. 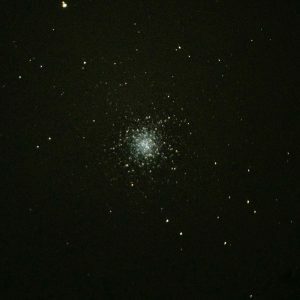 I looked at the Hercules Globular Cluster (Messier 13) first. It was like a diffuse scattering of dew drops spread on the petals of a flower too dark to see. Each of the individual stars were a bit difficult to see individually. But it photographed decently well. I saw, and photographed, a couple of others, but their photos were not entirely as impressive, and I failed to note which was which, so I could not properly identify them for this post. Future photos I plan to take will use either a narrowband O-III filter or a broadband UHC/LPR filter. The former permits a specific sort of light to pass through, while the latter tries to filter out particularly problematic types of light. Either should help both with photography and viewing. So hopefully the next few photos will be improved! I’ve learned a lot already.